The cramps are kicking in and your emotions are in a flurry of hormonal chaos. These symptoms are all to familiar; yep, it’s that time of the month. As Muslim women, though, being on your period is more than just mood swings and intense cravings for chocolate, it’s a time where Allah (SWT) have relieved us from obligations like prayer and fasting. Growing up, I loved getting my period, especially during Ramadan. I didn’t have to worry about praying or fasting. Of course, the younger version of me saw this as a wonderful free pass. However, as I got older, I a whole layer of complexity was added to being on my period during Ramadan. My mother, the gentle badass that she is, instilled in me that my period, regardless of the time of the year, came as a gift from Allah (SWT). How beautiful is that? Carrying these wise words in my heart, I grew to appreciate and love my natural, God-given female processes, even during the holiest month of the year. Internalizing the experiences of women who were shunned, guilted, and shamed, weighed my heart down with grief. The disheartening challenges that accompany a woman’s period, should not be added on to on by misplaced societal stigmas; the physical and emotional pain from being on your period is already plenty to handle! That being said, the key to fostering an environment where Muslim women can experience the beauty of their body requires the entire Muslim community to challenge traditional perspective and welcome love and understanding into their hearts. Being on your period during Ramadan, can be difficult, especially when you are trying to connect with Allah (SWT) and you are met with societal push back. 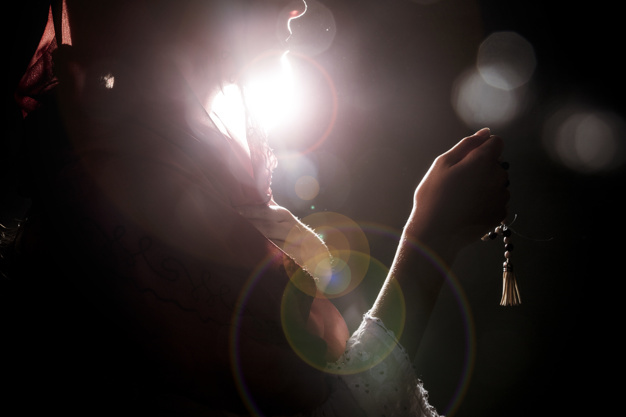 Being unable to feel the rush of divine love while standing in taraweeh prayer on the 27th night of Ramadan, crying when the imam starts making du’aa for people around the world– that can be difficult and frustrating. But, believe me, you are not barred from spirituality. So, to help guide you during your time of the month in Ramadan– and during any other time of year– I wanted to share a few helpful tips to get your spirituality high and your haters low. Du’aa (or invocation) means to call out to God with your problems, worries, and love. Making the time to talk to Allah (SWT) in an intimate way can truly relieve the worst pains and heal the deepest scars. In our busy lives, we often neglect to take the time to make du’aa. Obviously it’s not the end all, be all for all problems and issues, but for a spiritual pick-me-up and some practical religiosity, du’aa is the way to go. If you are anything like me, you do your five prayers and fast and rush to get to work and classes. However, when I am on my period, unable to pray and fast, I turn to making du’aa. Sitting in a room and taking the moments where I would face Allah in prayer to just talk to Allah (SWT), has truly centered my mind and recharged my spirituality in ways I can not explain. Tasbeeh means to repetitively (meditatively) utter God’s names and praises (i.e. subhanallah, alhamdulilah, allahu akbar). Repeating praise and glorification of Allah (SWT) may seem simple and effortless. Yet, often we forget, once again, to make time to remind ourselves of the power (and love) of Allah (SWT). For each utterance of ‘alhamdulilah’ and ‘allahu akbar,’ we build the bond between us and our creator. During your period, grab those tasbeeh beads (meditation beads) that have been used as a lovely décor and put them to good use. Personally, I cherish knowing that in my hand I possess the building blocks, or beads if you will, to create a stronger relationship with Allah (SWT). There is honestly nothing more soothing for a woman who is on her period than to take the time and listen to the Qur’an, and I mean truly listen. Beautiful holy worlds spoken in a melodic tone, have the power to uplift spiritual energy. Often times, we do not sit and actively hear the words of our creator. As with any relationship, listening is the best way to establish and strengthen a connection. Why not do the same for our relationship with Allah (SWT)? Being a human means you are an integral member of a community of God’s creation; helping give to the life around you will enrich your own life. Yes, volunteering to help kids to learn the Qur’an at your local mosque not only spreads the wealth of knowledge, but it helps your spiritual growth. But there are even simpler (underrated) ways of worshipping God through community service: picking up trash, checking in on your loved ones, and smiling at the world around you. There is special feeling that comes with giving back to your community; it is the feeling of love and there is nothing more needed to stand against traditional oppressive practice than love. Being on your period just means that you have the liberty to creatively find spirituality in anything around you. When I feel my cramps kick in, I like to take walks. With each step, I notice my surroundings. I see the trees that Allah (SWT)created to give us life and I remember that Allah (SWT) made me much like the tree; I, a woman, am capable of supporting life. My period is part of that natural processes. No human being can ever distort that truth. So, take that walk, see everything, and most importantly see yourself. Allah (SWT) created us and our periods, he knew that we need to eat and take rest so that we may continue our lives as he intended. So, ladies, eat, drink, and take care of yourself without shame and guilt. Allah (SWT) is your biggest ally during this time and he has presented you with this blessing to explore your faith beyond the traditional.